What a car! I haven’t exactly gushed about anything from Honda, since we started the blog. The main aim for me, is really to help people choose a car, that is the right price for their budget, serves their needs and gives you a good comparison of what options are available if you don’t have time, and you never buy any Car magazine that could probably give you equally sound advice on your options. With that being said, if you are looking for a premium car, that isn’t from one of the big 3 luxury German options, the new Honda Accord is a car that could be just perfect for you. Almost in the same way as Toyota has etched out its own luxury niche in Lexus, Honda are making a very bold statement with this new iteration. About 4 years ago, I had tried out the older Accord. I found it great to drive, really comfortable, but with not enough power. I am sure that the Honda test drivers in Japan, had probably felt the same way. Honda has gone to great lengths of late, to remind us of their F1 heritage, and current partnership with Mc Claren. 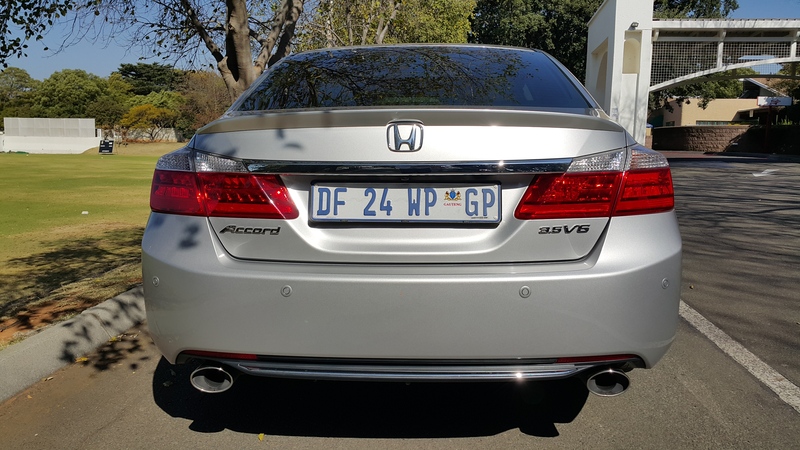 Well the new Accord certainly doesn’t disappoint, particularly in the power department, with the new 3.5 V6 engine sending real shivers down my spine along the N14 to Magaliesburg. The initial look at the huge Accord is the very long body. 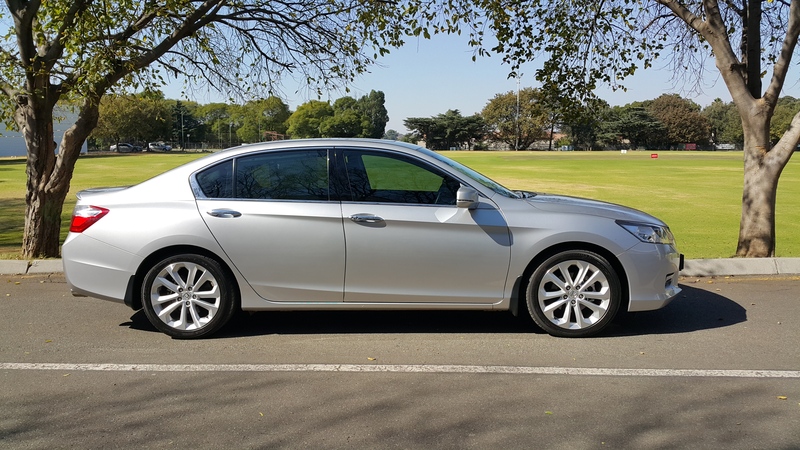 When I attend the Jazz launch earlier in the year, they had an Accord on display at Montecasino in Fourways, Johannesburg. The moment that I jumped into the back, I felt like this was the right place to be. The interior is a large expanse of very upmarket materials. Sometimes manufacturers other than the big 3 Germans, really can get this wrong. 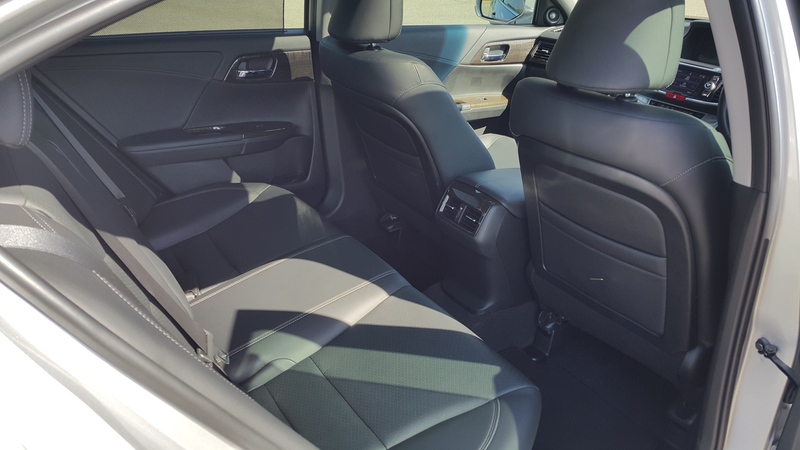 I really do love the leather, the back seats are very comfortable and the driver`s seat is electrically adjustable. The seats are also heated in the front, and this has already started to come in handy, with winter seemingly arriving one month in advance. 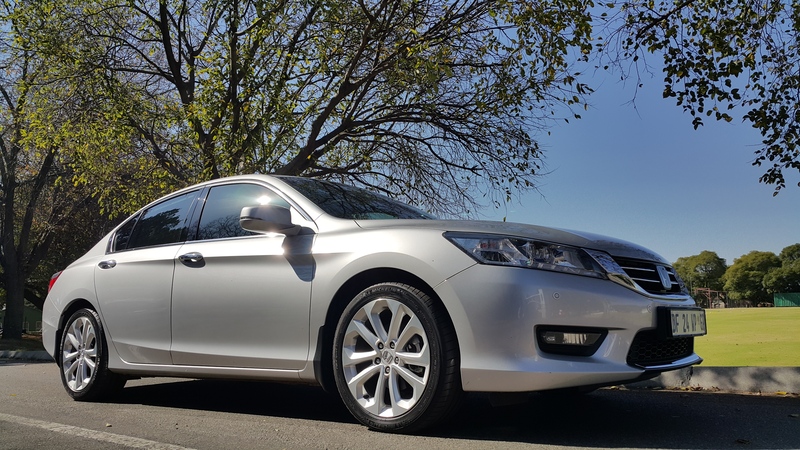 With the temperature dropping, and the traffic getting even worse every single day with Load Shedding, you will be pleased to find the Accord a very nice place to be! The interior is very quiet, and even at speed, you hardly notice the outside world thanks to really great sound proofing. I will say that it is not quite as luxurious as an E class, or as nimble to drive as a BMW or Audi, but it is certainly the best Honda that money can buy right now. The interior features a lot gadgets that have been copied straight from the upper class textbook. The main aim here is to give you more car, without having to reach for the options list like you do, when buying a (GERMAN) new car. The car is specified with loads of extra equipment as standard, and I have to say at this point, that the Bluetooth system for the phone and audio linking is superb. 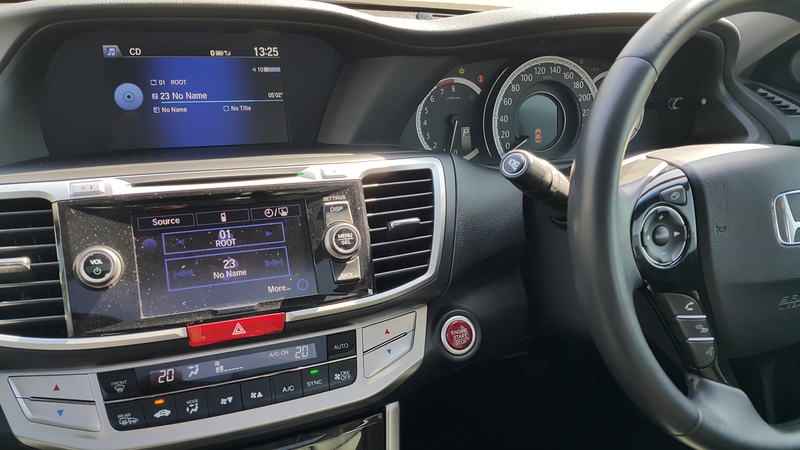 Out of all the cars we have tested thus far, the Bluetooth system and interface on the new Honda JAZZ, CRV and Accord are really stellar. They are very very simple to use, they are quick to link, and even my family who are less technically inclined, would have no problem syncing everything, with my guidance over the phone. The Honda is really easy to use. The layout of the dash – and huge numbers, makes me think that this car is targeted at your Director, or his boss, who may be leaving on retirement. Honestly. The only thing bigger than the numbers on the Speedometer, is Julius Malema`s ego. The power plant we had at our disposal, was the 3.5 l v6. It was an automatic, as my love for Manual cars leaves this world, every time a robot is out. If I do have to drive a manual car, then the clutch and gearbox better be good. This automatic doesn’t hunt for gears, is quick to change and the sound was absolutely phenomenal. Once again I got about 9.5 l / 100 kms on two trips, to Magalies and back from Johannesburg Central. We had someone to drop off at conference – and the drive was great. 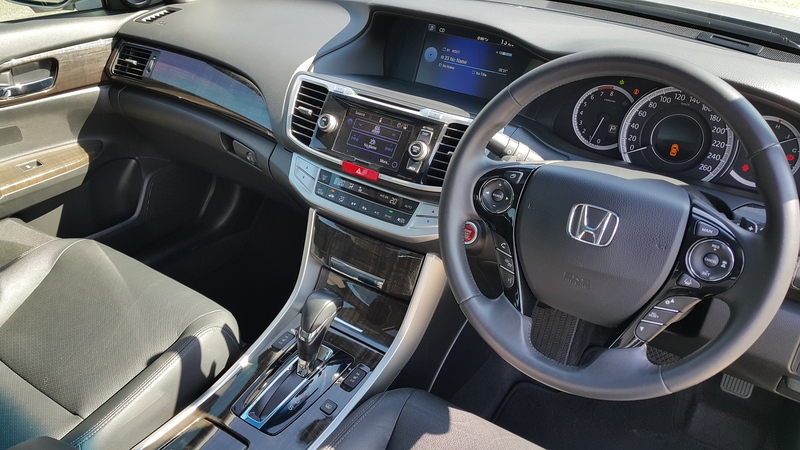 The Accord still lacks steering feel, like most Honda cars. The engine has definitely had some improvements from the last 2.5 I drove in 2009. I had driven it against the 3 series then, and chosen BMW, because I like feeling the road more. This Accord though, I think is in the league of the E Class, A6 and BMW 5 series. It has incredible safety features, like a rear mounted camera that picks up your left blind side, whenever you indicate. It has a feature to actively monitor the car via radar in front of you, when the car is in cruise control mode. I found the active cruise control a bit twitchy on my trip, and only used the cruise once on the 150 kms we covered on the day. Overall the rear legroom and seats in this car, were more comfortable than anything we have tried thus far. The rear window blind and sunroof – worked like a charm, with the sunny but cold weather we had on the day. I kept thinking about the 5 series from BMW, while driving the Accord. On the road, the power is immediate, it doesn’t have much body roll and superbly quiet and comfortable. When the road does get very bumpy, it doesn’t seem to soak up the bumps as well as others, but it is great on normal roads. This car comes with a 5 Star Euro NCAP on the last model. Once we have an update from the Global NCAP team, we will post those findings year, but I don’t expect it to be less than 5 stars once again. Have a look at the Lexus ES 250 blog we wrote. 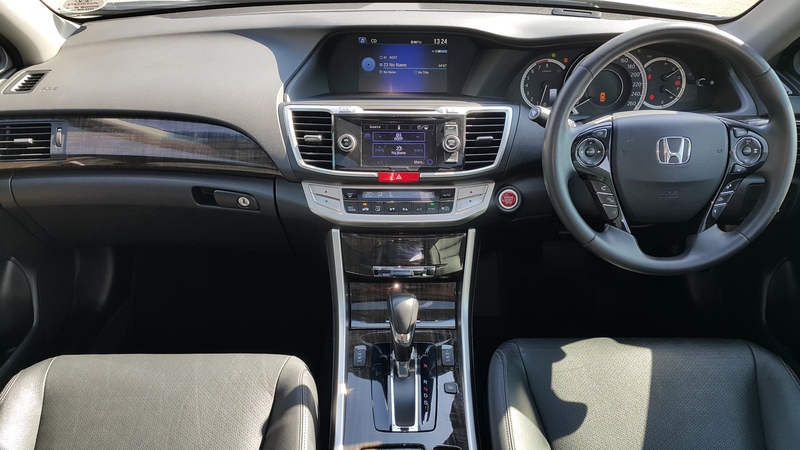 The Honda has way more power, but I think the Lexus is a bit softer, but equally well appointed in terms of luxury, the Lexus just has less features and the system that navigates the commands is not great to use. I think in terms of quality, and pricing vs benefit – both are equal. Once again we dealt with Nujmah at Honda West Rand. She is the reason we still blog on Honda, and unlike most dealers we have dealt with so far, she actually is on time, follows up consistently and sticks to her word. So 10 points to Nujmah – her manager Max and the entire team in Sales who kept on pushing for me to do this blog! I would rate his car 4/5 and the dealer 5/5 on pure service and warmth, each time we walk in! This entry was posted in Car Preview, Car Review, Car Test, Honda, Honda Accord, Honda Car Review. 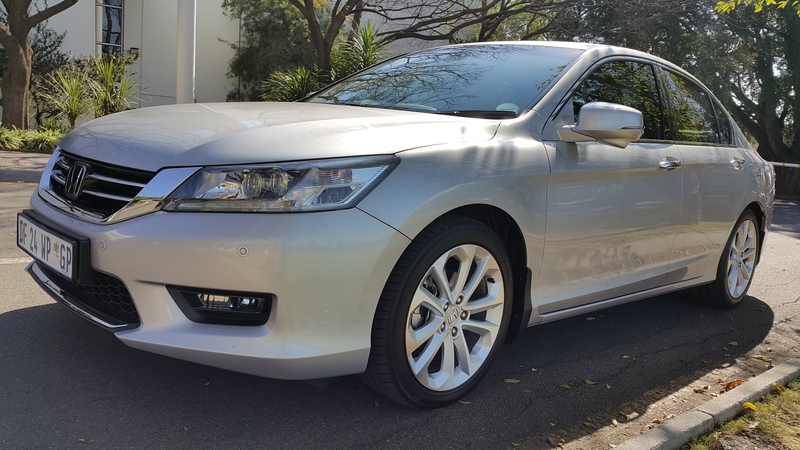 Tagged Accord, Car Review, Honda Accord, Honda West Rand, Nujmah SAmodien.